Theo Fleury, at 5'6" made a name for himself in a game played by giants. A star in junior hockey, he became an integral part of the Calgary Flames’ Stanley Cup win in 1989. Fleury’s talent was such that despite a growing drug habit and erratic, inexplicable behaviour on and off the ice, Wayne Gretzky believed in him. He became a key member of the gold medal–winning men’s hockey team at the 2002 Olympics. 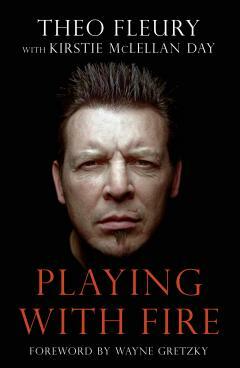 In Playing with Fire, Theo Fleury takes us behind the bench during his glorious days as an NHL player and talks about growing up devastatingly poor and in chaos at home. Dark personal issues haunted him, with drinking, drugs, gambling and girls ultimately derailing his Hall of Fame–calibre career.